I'm a routine beer drinker; it's normal for me to try at least one new one, if not more, every week. There are so many bars in my area of Philadelphia with unique beer selections it’s hard to resist. 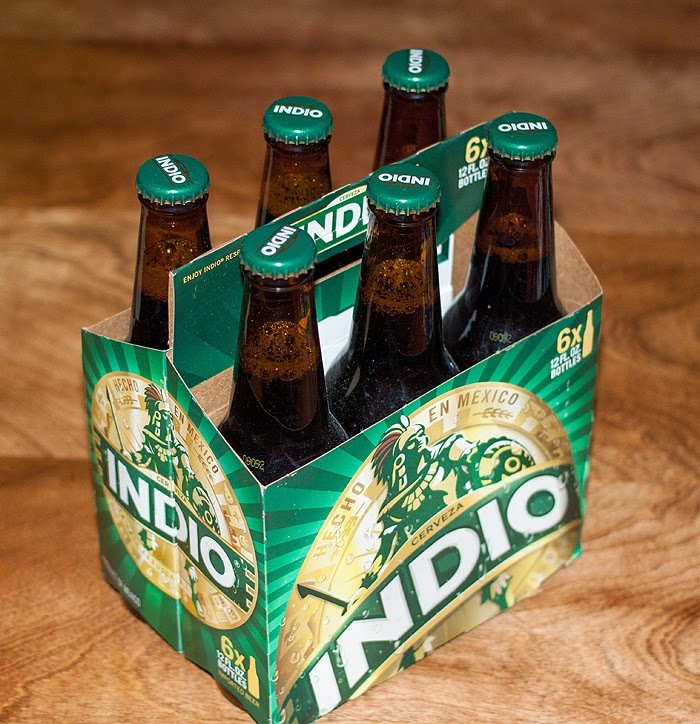 Thanks to The Food Hunter, who of course noticed my impeccable taste in fine beer, I was recently sent a sample of the Mexican beer Indio, to review. Oddly enough, despite living and spending a great deal of time in Arizona where Mexican beer is readily available, I had never tried Indio. My first impression was that it's an easy to drink Mexican beer. In fact, it's something you could drink all day. By virtue of it being darker it's more satisfying to a beer snob than the more popular Mexican beers such as Corona. My wife astutely stated that it tastes like summer after taking her first sip. I think she's right! Indio lacks some of the personality that I've grown accustomed to in a good micro brew, but it's not bad. I can see this being a great beer for a party, especially a summer BBQ, where you want a beer that no one will complain about. Indio is more unique and special than regular domestic beer and very refreshing. Though not my favorite, I can see a number of people enjoying this beer, particularly those with a lighter palette. Give it a shot on a warm summer's day! If you're not a beer drinker but want to give Indio a try; here's a refreshing cocktail to make with it. 1. Muddle the watermelon in a shaker, add mezcal, agave and lime juice. 2. Shake hard with cubed ice and strain into a highball glass over ice. 3. Top with Indio beer and stir to combine, garnish with a watermelon flag or an edible flower. Would have loved to see a picture of the drink....sounds quite tasty! My hubs would dig this! I need this in my life. Perfect for the holiday weekend. Thanks for introducing me to a new beer. I'm not normally a beer drinker but I would totally love a glass of that cocktail! My husband is a big beer fan so I'll have to tell him about this! Not a beer drinker, but I do like the idea of using it in a cocktail like this. Sounds like the perfect thing for an end of summer get together. My husband and I are not beer drinkers, but I bet this would be a hit at a party. Have you tried Philippine beer? I'm not a drinker but I've heard from those who are that ours is one of the best in the world. I'm not a beer drinker but I do love watermelon so I might have to give this a try! I bet the watermelon in the cocktail would make anyone a beer drinker! I'm thinking that watermelon/beer cocktail would be just about the most refreshing thing possible on a hot day!